Monika and I buy a lot of groceries. The reason for this is two fold, I suppose. Firstly, we struggle to find healthy, vegan options when we dine out, although I can recommend some great places to eat if that’s what you’re looking for. Secondly, we honestly truly enjoy cooking at home. When you prepare most of your own meals, at home, you need a lot of raw ingredients. Other than having ridiculously cheap toilet paper, kitty litter and contact lens solution, BJ’s and Costco also have great deals on raw ingredients. A short list of them includes: walnuts, pine nuts, raw sugar, peanut butter, tea, canned beans, artichoke hearts, sun dried tomatoes, olives, pickles, cashews, tomato sauce, canned tomatoes, canned any vegetables, flour, sugar, olive oil, cereal, rice, etc. Now, I have appreciated these “big box” clubs carrying vegetarian and vegan and low-sodium options. I’ve even gone as far as sending them letters telling them that every new vegetarian product has indeed been seen, recognized, appreciate and purchased. And, I truly do appreciate their buyers looking for newer options for those with “dietary needs.” I do believe in supply and demand, and I do politely demand what I wish a store would supply. That’s just common sense, even when you’re dealing with a huge company. Honestly, sometimes they listen to customer feedback. In any case, asking for vegetarian is a pretty darn big dietary restriction, I suppose, although we don’t really feel like it’s a restriction but more of a liberation, to be honest. However, I will admit that taking the next step to becoming a vegan is most definitely restrictive. It’s downright aggravating, in fact. I just can’t understand why so many companies, with good intentions and good hearts, still insist on adding just a tad of milk or casein or gelatin or egg or butter or fat or any number of other things that can be substituted to their products!! That is all besides the fact that thousands if not millions of products could easily already be vegetarian but are not. Honestly, most products add salt and animal fat for flavoring in the US, and it’s absolutely ridiculous. I understand why chicken soup has chicken broth, and clam chowder has clams in it, but why the hell does vegetable soup has a multitude of animal products in it?? Especially when there are absolutely, positively the same tasting, but vegetarian, products to flavor soup on the market!??? Here are a few examples from some stores that we shop with that show how difficult it is to find enough products to truly be a vegan. Obviously some of these can’t be made any other way, but I’m putting them out there just to illustrate how frustrating it can be sometimes to find good food that has no animal products, which is why Monika and I do most of our cooking at home. 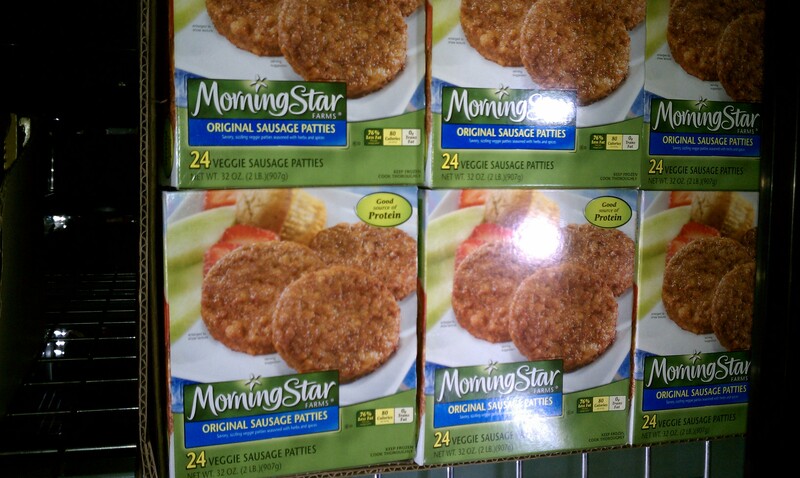 Morning Star Farms is a great company that make many delicious products. And, I still enjoy most of them. These breakfast sausage patties are really quite tasty, have a great texture, can be fried, toasted, baked or microwaved and make great little English Muffin sandwiches. Made from organic soy products, they are low in fat compared to the real thing. Unfortunately, they are also NOT VEGAN. They contain egg whites and milk. 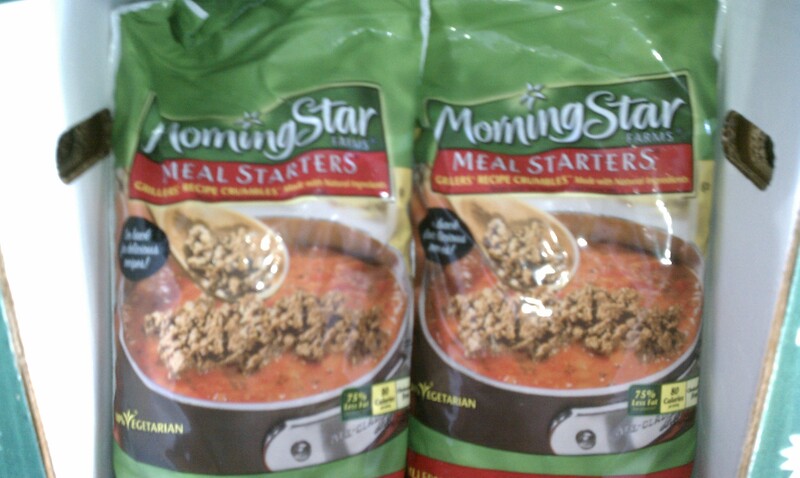 Morning Star Meal Starters Crumbles are a great substitute fro ground beef. The main ingredient is a flavored TVP (textured vegetable protein). For tacos, burritos, and chilli, this products is a great vegetarian substitute. Unfortunately it as also NOT VEGAN as it contains skim milk and egg whites. 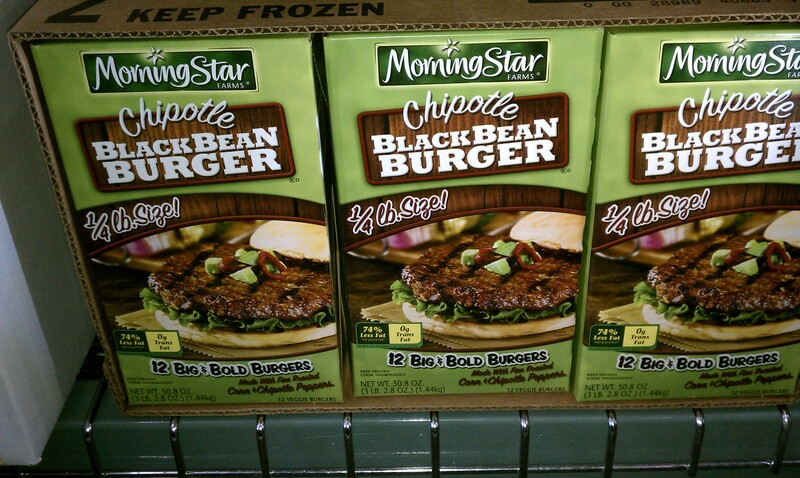 Next up, Morning Star Chipolte Black Bean Burgers. These are quite delicious, although a little hard to keep together on the grill. I usually bake these in the toaster over to make them nice and crisp. These are used by many restaurants, including TGI Fridays, as their house bean burger. We’re always happy to find major chain restaurants serving any vegetarian options, but again dining out as a vegan is sometimes impossible. These are also NOT VEGAN as they contain egg whites and calcium caseinate. 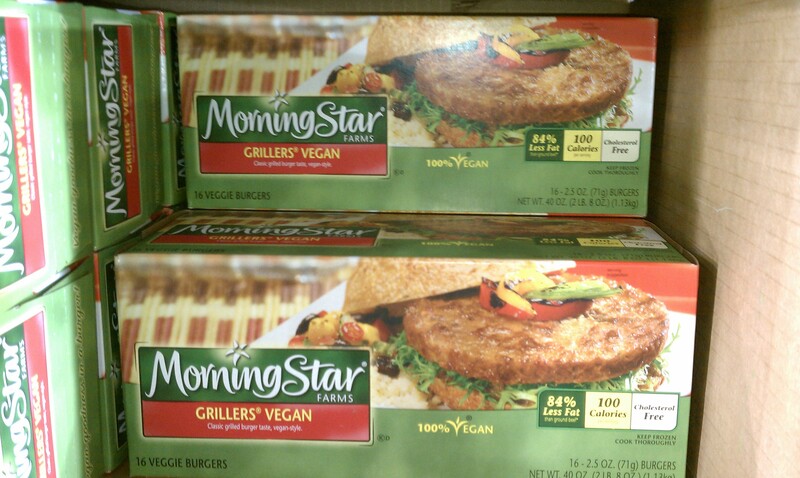 Okay, this finally brings us to the last Morning Star product that my local BJs sells, the Grillers Vegan. This product actually is VEGAN, and says so right in its name. And, considering it doesn’t have any of the egg white “binder” included, they hold together and grill up quite well. They stay juicy and are very versatile. I even use them to crumble up and put in my veggie chilli and have used them in tacos before as well. I highly recommend them as a vegan substitute for a burger. 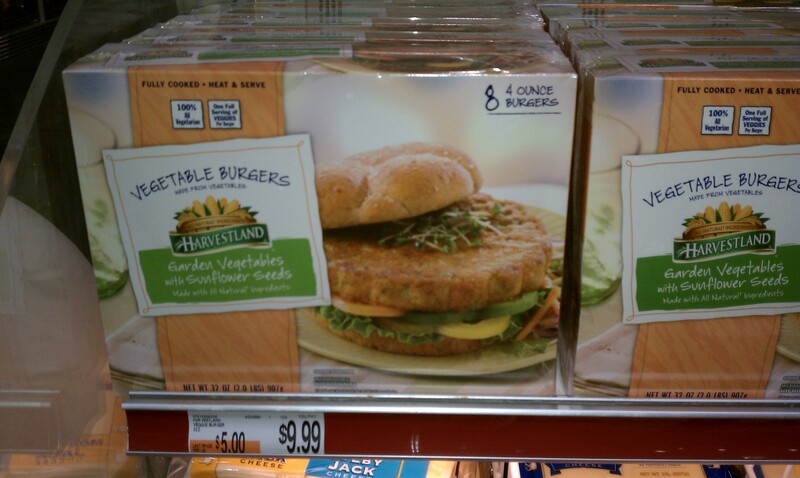 BJ’s, form time to time, carry other brands of Veggie Burgers, I guess to see how they sell. These came from Harvesland.We tried these and actually, they weren’t too bad. Again, you could really see the veggies that made them up. What you couldn’t actually see was the egg whites that make the NOT VEGAN. 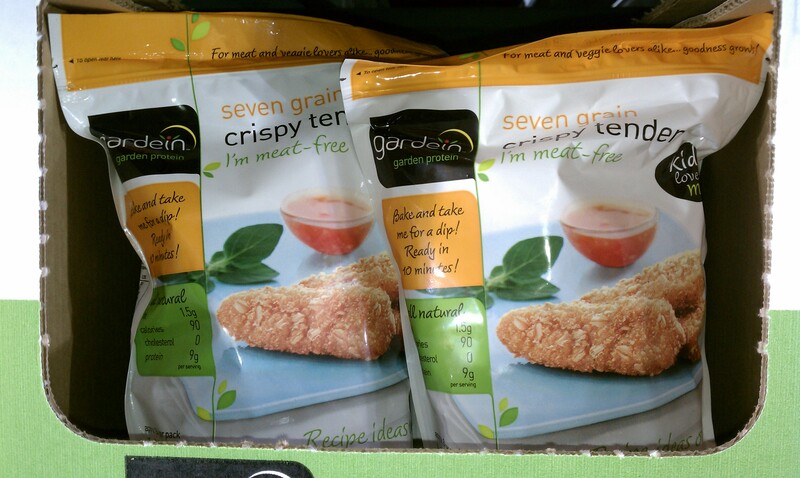 These Crispy Tenders made by one of our favorite companies, Gardein, starting showing up about two years ago and quickly became a staple in our house. They bake up beautifully crispy. It’s what I ended up using in this recipe, and we would also just eat them like nuggets with some bbq or ketchup. 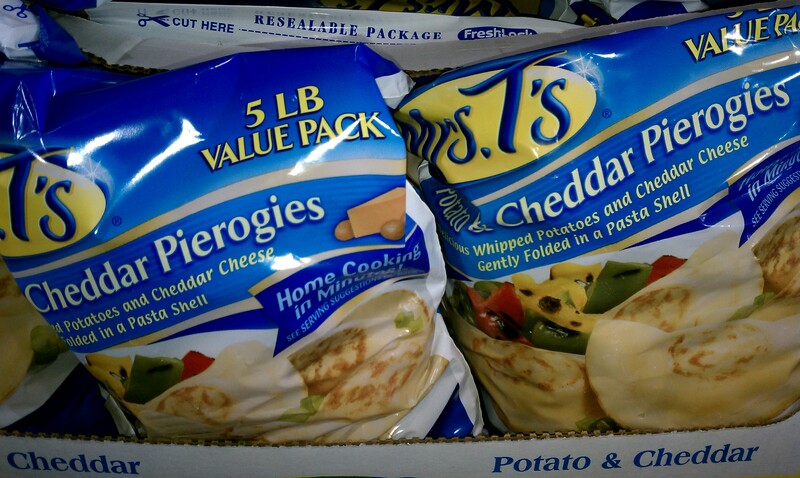 They are really a quite diverse product and we still buy them when we can. Unfortuantely, BJs stopped carrying them a while back, which was a shame because not only did they come in an extra large package that was a great value, this product is TOTALLY VEGAN. 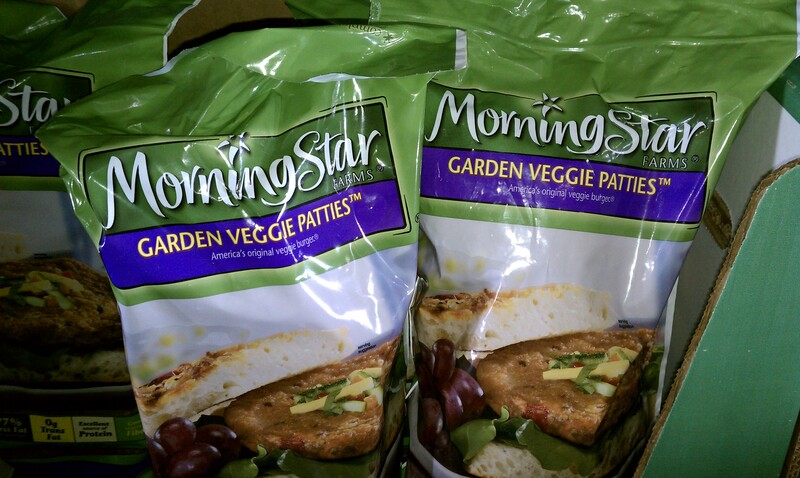 I’ve been shopping at BJs for years, and I had some perennial favorites that had to go when we went vegan completely. This one barely needs any further explanation since Cheddar Cheese is right in it’s name. I always liked boiling a frying up some of these with some onion late night and having some with a little oil. Oh well…NOT VEGAN. 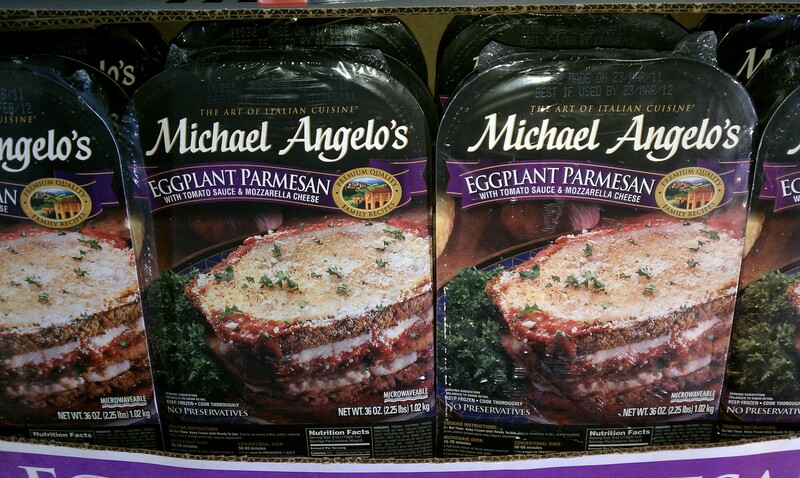 And these ready to go Eggplant Parms from Michael Angelo’s were awesome to pop in the oven for a full, delicious meal. It’s a shame because not only were they delicious, the company made a product with very little ingredients, and no fillers, additives, or preservatives. The ingredients always tasted fresh and of great quality, including the three varieties of cheeses that they contained, making the NOT VEGAN and off limits. Next time I stop by Whole Foods, I’ll snap some pictures and update a second page of examples, which will be available here. This entry was posted on August 27, 2013 at 9:10 PM and is filed under Recipes, Vegan and Vegetarian Lifestyle with tags cooking, vegan, vegetarian. You can follow any responses to this entry through the RSS 2.0 feed. You can leave a response, or trackback from your own site.